Successfully Added MyCube - Desktop Multimedia MP4 Player w/ DVB-T and TV Recording to your Shopping Cart. High-quality digital television is made portable with the MyCube Desktop Multimedia MP4 Player. This amazing media box can be used anywhere and is sure to keep you entertained with its crystal-clear DVB-T digital TV, music player, and FM radio. Best of all, it also includes instant DVB-T digital television recording for when you want to watch something again and again! With today's busy lifestyle, who actually has time to sit down and actually watch some good old television? Your favorite show or sports team may be on, but you're either out and about or stuck at work and unable to watch TV... but thanks to the MyCube, television is brought to you! Bringing you free and easy DVB-T digital television, the MyCube Desktop Multimedia MP4 Player is the best way to stay up to date on your favorite news, sports, or entertainment programs. With its light and portable design, you can actually carry it around with you and use it anywhere! It doesn't matter if you're waiting in the car, reading at the library, or bored at work, the MyCube Desktop Multimedia MP4 Player will constantly bring you the highest quality DVB-T digital TV. It even offers an amazing TV recording function so you can record whatever is on: the NBA finals, the Superbowl, the Wimbledon's, or even the next episode of House. Everything is recorded onto a micro SD card, so you can view it again and again on the MyCube, or transfer it to your computer for later watching. If nothing good is on, just load up and listen to up your favorite songs with the music player, or listen to the MyCube's FM radio! Need something to spice up your room? Bored at work and need an easy way to watch TV? No television at the dorm? The MyCube Desktop Multimedia MP4 Player w/ DVB-T and TV Recording is here and ready to ship directly to your or your customer's door. Buy one today for yourself and start enjoying TV everywhere you go. Even better, take advantage of our factory-direct price to outsell your competitors on eBay and Amazon. From your best source of the latest high-tech gadgets, Chinavasion. 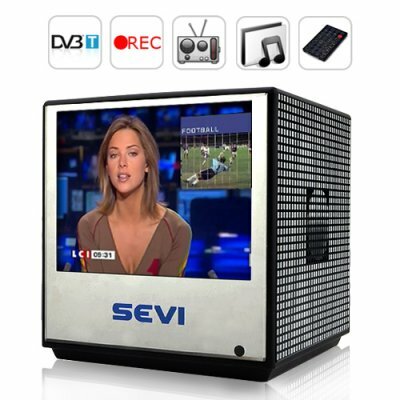 TV recording function - instantly record whatever is on! Note: This product supports the DVB-T digital TV format. To find out if your country supports DVB-T you should visit [http://www.chinavasion.com/digital-tv-explained.html] . This DVB-T product receives MPEG-2 encoded signals. Please check whether your region's Digital TV broadcasts are MPEG-2 type or MPEG-4 before purchasing this product. Does the MyCube DVB-T Digital TV Player include FM radio? Does this product come with a micro SD card? No, however, you do not need a micro SD card to enjoy watching DVB-T television. The micro SD card is only if you wish to record TV shows or put MP3 files on it and listen to it through the music player. Will this digital TV work in the USA? No, USA digital frequencies are broadcasted in the ATSC format and not DVB-T.